Lamb is divided into large sections called primal cuts, which you can see in the chart above. These large cuts are then broken down further into individual retail cuts that you buy at the supermarket or butcher's shop. Unlike beef, which is divided into sides, lamb is first divided into sections called the foresaddle and hindsaddle, which are then broken down further into their component primal cuts. To begin, let's look at the lamb primal cuts in the foresaddle, which is the front of the animal. As a rule, lamb is fairly tender, which means that most cuts of lamb can be cooked using dry heat—even when the same is not true for a corresponding cut of beef or pork. One example of this is the lamb shoulder. The lamb shoulder is often roasted, in which case it is usually boned and rolled; it can be stuffed as well. Lamb shoulder is also sometimes cut into chops, though these chops are not as desirable as the rib or loin chops. Lamb shoulder can also be cooked with moist heat, such as braising. Sometimes called the "hotel rack," the lamb rib primal cut is where we get some of the animal's most impressive-looking cuts: lamb rib chops, lamb crown roast, and rack of lamb. Imagine being presented a rack of lamb with all the legs perfectly frenched (fat and sinew trimmed away) and the row of chops in the rack glowing with a top crust of aromatic herbs, garlic, olive oil, and crushed pistachios. Depending on the size of the ribs, some lamb chops might comprise two ribs. A lamb's breast, which is worked heavily whenever the animal moves, contains a lot of cartilage and other connective tissues. This makes the breast one of the few lamb primal cuts that needs to be cooked low and slow with moist heat. Lamb breast can also be used to make ground lamb. Another tougher cut with a lot of cartilage, the lamb neck is best used for making lamb stew. If you're up for a little adventure, try adding a can of Guinness stout—a traditional ingredient in Irish stews—and perhaps a few lamb shanks to the slow-cooking pot. Root vegetables and peas go in the last half hour. The shanks are the lower section of the animal's leg. On each side, there's a foreshank in the foresaddle and a hindshank in the hindsaddle. They're extremely tough and full of connective tissue because they work all day, every day. The lamb shank is the basis of braised lamb shanks, a dish that's a favorite of chefs for its fall-off-the-bone tenderness and particularly succulent consistency and flavor. Lamb shanks are usually oven braised with a good red wine, vegetables, and herbs in a roasting pot or dutch oven; they can also be made successfully in a slow cooker. 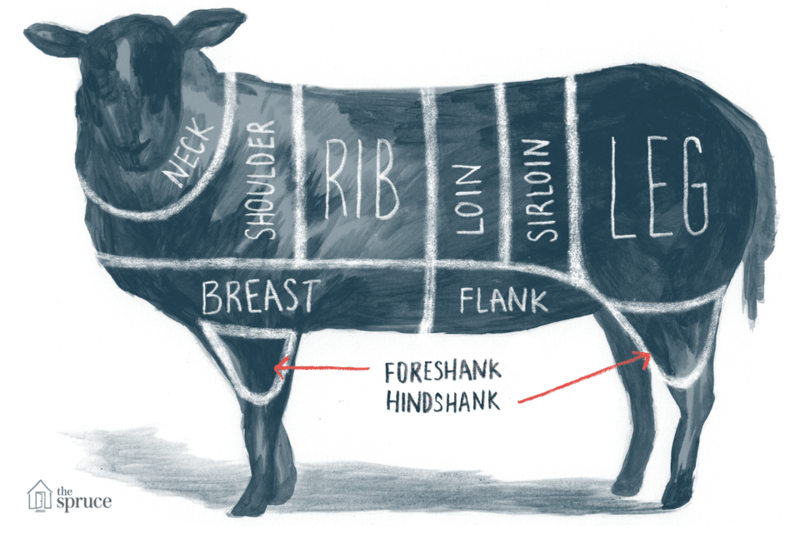 Let's move on to lamb primal cuts from the back of the animal—the hindsaddle. This area is the source of the some of the tenderest and, thus, prized cuts of the lamb. The lamb loin is where we get lamb loin roast and lamb loin chops, both tender cuts that are best prepared using dry heat. The entire lamb loin can also be cooked on the grill slathered with rosemary, garlic, and fresh lemon juice—frequently used with lamb to cut the generous fatty taste of the animal. The lamb sirloin is sometimes considered part of the leg primal cut, but it can also be prepared separately. In this case, it is frequently cut into chops or steaks and cooked using dry heat. Lamb flank can be tough unless cooked with moist heat, so braising is best. Lamb flank can also be used for making ground lamb. The leg of lamb, a large, relatively expensive cut of 3 to 5 or 6 pounds, can be cut into leg chops, though it is usually prepared whole and presented with pride at big family meals or on special occasions. Roasted leg of lamb, studded with slivers of garlic and sprinkled with oregano and fresh lemon juice or red wine and surrounded by rough-cut potatoes cooked in the pan juices, is a common preparation in Mediterranean countries. In Greek and other cuisines, leg of lamb braised with tomatoes, garlic, and wine with orzo or another pasta is popular. In France, the classic roast lamb with white kidney beans of coastal Brittany comprises a leg of lamb (un gigot) that's studded with garlic slivers and sprinkled with fresh thyme, then roasted and served with white haricot beans precooked in wine and plenty of aromatics and a luscious gravy of pan juices. What Is Skirt Steak? and Is It the Same as Flank Steak?